Neuron-specific PERK inactivation aggravated EAE-induced neuron loss in the CNS gray matter. 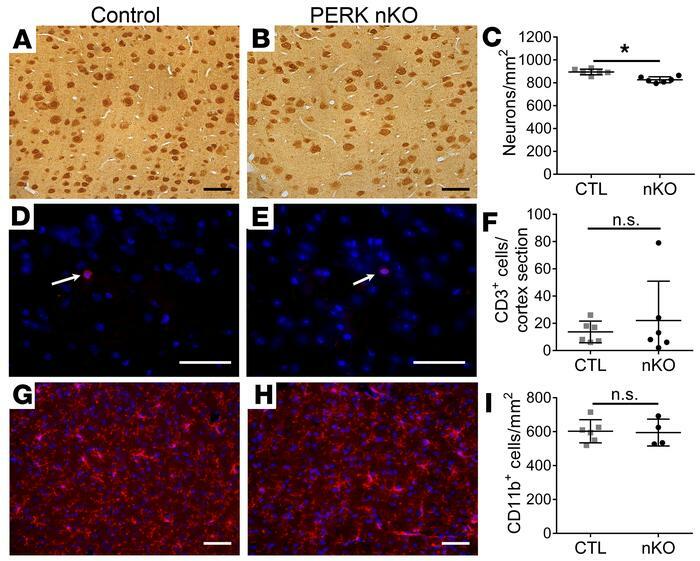 (A–C) NeuN IHC revealed that PERK-nKO mice with EAE had significantly increased neuron loss in the layer V of the primary motor cortex compared with control EAE mice at PID 38. n = 6 animals. (D–F) CD3 immunostaining revealed that neuron-specific PERK inactivation did not significantly change the number of T cells (arrows) in the layer V of the primary motor cortices of EAE mice at PID 38. n = 6 animals. (G–I) CD11b immunostaining revealed that neuron-specific PERK inactivation did not significantly change the number of macrophages/microglia in the layer V of the primary motor cortices of EAE mice at PID 38. n = 4–6 animals. Scale bars: 50 μm. Error bars represent SD. Statistical analyses were done with a 2-tailed t test, *P < 0.05.